If you think that people with diabetes should always avoid sugar, think again — they can enjoy the sweet stuff, in moderation. “The best bet is to use a very minimal amount of real sugar as part of a balanced diabetic diet,” says Keri Glassman, MS, RD, CDN, of Nutritious Life, a nutrition practice based in New York City. That being said, sugar substitutes offer sweetness while controlling carbohydrate intake and blood glucose. There are many sugar substitutes to choose from, but they’re not all calorie-free and they vary in terms of their impact on blood sugar. “The major difference between the sugar substitutes is whether they are nutritive or non-nutritive sweeteners,” says Melissa Mullins, MS, RD, a certified diabetes educator with Johnston Memorial Hospital in Abingdon, Va. “Non-nutritive sweeteners provide no calories and no changes in blood glucose levels, which is perfect for people with diabetes.” Here are six sweet options to consider. Splenda is a brand name for sucralose, a non-nutritive or artificial sweetener, which is excellent for people with diabetes — type 2 diabetes in particular. Splenda is 600 times sweeter than sugar, says Glassman, but those little yellow packets have no effect on blood sugar. In addition, Splenda passes through the body with minimal absorption. Saccharin, the sweetener sold in pink packets under the brand name Sweet ‘N’ Low, is calorie-free and is about 300 to 500 times sweeter than sugar. Though it can be a sugar substitute option for those with diabetes, “research has shown that the intake of saccharin can lead to weight gain,” Glassman warns. “Usually, when one eats a sweet food, the body expects calories to accompany that food. When the body does not get those calories, it looks for them elsewhere. This can lead to greater calorie consumption throughout the day as your body craves the caloric satisfaction it has missed,” she explains. Aspartame, sold in blue packets under the brand names Equal and NutraSweet, is a non-nutritive artificial sweetener that is 200 times sweeter than sugar. While not zero calories like some other artificial sweeteners, aspartame is still very low in calories. But while the U.S. Food and Drug Administration has reviewed the scientific research and found aspartame to be safe for human consumption, Glassman notes that there have also been some conflicting study results on aspartame’s safety. “Although its low calorie reputation is appealing for most weight-conscious individuals, it has been linked to many negative side effects,” Glassman says. “Some research shows linkage to leukemia, lymphoma, and breast cancer. Other research shows a linkage to migraines.” In addition, people with phenylketonuria (PKU), a rare condition in which they are unable to metabolize phenylalanine (a key component of aspertame), should not consume this sugar substitute. The “newbie” among sugar substitutes, is derived from the leaf of the stevia plant that’s native to Central and South America. 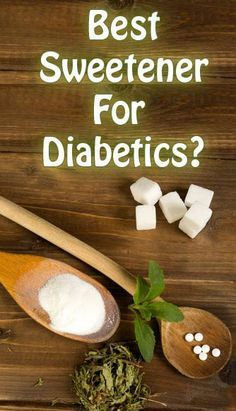 Truvia and Pure Via, another brand of stevia-based sweetener, are calorie-free and have been shown to have little to no impact on blood sugar, making them excellent sugar substitutes for people with diabetes. The FDA has approved the use of certain stevia extracts, which it has generally recognized as safe. Stevia extract is used as a sweetener in foods and beverages, and in brands like Truvia and Pure Via. There have been anecdotal reports of side effects associated with overconsumption of stevia, including headaches and gastrointestinal symptoms, but to date there is no solid scientific research to back these up. Sugar alcohols, or polyols, are derived from the natural fibers in fruits and vegetables. They do contain some carbohydrates so are considered nutritive sweeteners, and they also have some effect on blood glucose levels. Though sugar alcohols are relatively low in calories and more blood-sugar friendly than carbohydrates, they may have a laxative effect and cause indigestion, bloating, diarrhea, and headaches in some people. See how you respond to a small amount before incorporating them into your daily diet. Examples of sugar alcohols include sorbitol, mannitol, and xylitol. Mullins says that the carbohydrates in sugar alcohols are not fully absorbed. “I recommend that people who are going to use these sugar substitutes keep track of carbohydrate levels,” she says. “Subtract half the amount of sugar alcohols from the total number of carbohydrates in a given food to understand how many net carbs are actually affecting blood glucose levels.” Keep in mind that even if a food is sugar-free, that doesn’t mean that it’s also calorie- or carbohydrate-free. Always look at the Nutrition Facts label for a full picture of what’s in a food.